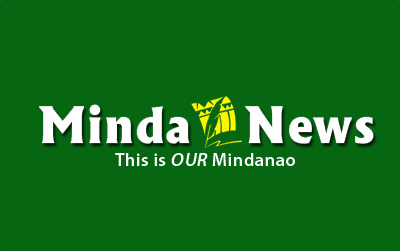 DAVAO CITY (MindaNews/23 April) — For the 210 households who are currently living in the village of Sta. Cruz, a picturesque coastal village in Tanauan, Leyte, Davao del Norte was of no particular importance to them before they were hit by super-typhoon Yolanda. But today, five months since Yolanda, the residents of this village which used to have more than 400 households not only know where Sto. Thomas is, but have deep appreciation for this town. For more than two months now, around 20 carpenters from Sto. Thomas came to this village to rebuild their chapel and on May 10 they will be able to celebrate their barangay fiesta with a brand-new, beautifully built chapel. This little miracle took place thanks to the generosity of Marsmann Co. based in Davao which made possible the arrival of these carpenters to Sta. Cruz to first rebuild the chapel but who will also be assisting the survivors in rebuilding their houses. Marsmann is also assisting the fisherfolk of Sta. Cruz procure fishing boats for their use as their livelihood was severely affected by Yolanda. During the past few weeks including the Holy Week, while the carpenters were busy finishing the construction work of the chapel, a lay Redemptorist missionary from Toril, Davao City, Malou Caminade – along with other members of her mission team – provided psycho-social and spiritual integration with the traumatized population of this village. Being located along the coastal area smashed by the storm surge, Sta. Cruz suffered immense devastation. Houses were washed out by the giant waves. In the aftermath, 223 persons perished and 18 remain missing. With such heavy losses, trauma healing and stress-debriefing are urgent needs for the people, from kids to the elderly. Sta. Cruz is just one of the villages of Leyte who benefited from the generosity and sense of sacrifice from Mindanawons who came all the way to this island to assist the survivors. Having suffered both natural and man-made calamities, countless Mindanawons have experienced the consequences of being disaster victims. Having recovered from such calamities, they wish to pay back for the generosity of those who came to their aid in their hour of need. Various LGUs from Mindanao sent their financial, technical and other assistance to the Warays. Mayor Rodrigo Duterte of Davao City arrived on a helicopter to bring a sizable financial grant to Tacloban City’s LGU. When various fund-raising events were organized by different non-governmental groups and institutions, including dioceses and parishes across Mindanao-Sulu, many Mindanawons responded generously. But apart from sending money and relief goods, a good number volunteered to come and help the survivors. One of the first to do so were mainly women religious and lay associates belonging to BALSA, SAMIN and related groups who organized teams to provide psycho-social integration to survivors across Leyte. A group from the dioceses of Davao, Digos, Tagum and Mati (DADITAMA) organized a group who would not only deliver relief goods to some parts of Leyte but also express their sympathy for what they went through. A group stayed briefly in Barangay Liberty, Mayorga, Leyte and today one sees T-shirts worn by citizens of Liberty with the words DADITAMA Volunteers printed on the back. The Barangay Captain and the kagawads continue to talk about what the DADITAMA volunteers did in their village that helped to rekindle hope for the survivors. At the grounds of the Cathedral in Palo, Leyte where a mass grave is located, there is an interesting sign of life at the corner facing the main highway. The Davao-based MacCondray Plastic Products, Inc. put up a model farm (naturally, using plastic products) but promoting organizing vegetable farming. Their technicians came to set up the demonstration farm even as they hired local ones to maintain the garden. Those needing technical input so that they can set up family or communal vegetable farms –which are very relevant livelihood projects these days (since Tacloban City continue to rely on vegetables and fruits marketed from far-away Bangkerohan in Davao City) are readily entertained by the technicians when they come to the demonstration garden at the very heart of Palo. But one of the most extensive and sustained assistance that the Warays received from Mindanawons came from the Diocese of Pagadian. Bishop Emmanuel Cabajar, CSsR and the Pagadian clergy have organized seven batches of volunteers, mainly carpenters to come and assist in repairing damaged churches and houses and construct new ones. Priests and lay people came as volunteers along with their Bishop. But the most remarkable feature of this volunteer program is that there are Maguindanao Muslims who joined, mainly from the town of Dimataling, Zamboanga del Sur. Fr. Pepito Suarin, parish priest, and his collaborators in the parish’s Tri-People Interfaith Program have mobilized the Moro volunteers to join the group. Inter-acting with the Moro carpenters has been one of the surprises of the survivors assisted by these volunteers. This program hopes to continue sending volunteers to Leyte in the near future. It may be a little while before the Sto. Thomas carpenters in Sta. Cruz will be back home with their families as their presence remains very much needed and the Marsmann Co. has made a long-term commitment with the LGU of this barangay. How this partnership arose is one of the inspiring stories in Leyte. In a location fraught with desperation and misery, the work done by the helping hands of people from across the sea has been a source of hope and inspiration for the survivors.